Naval History & Heritage Command photo NH 66752. Henry A. Walke was born in Princess Anne County, Virginia, on 24 December 1809. He was appointed midshipman in the US Navy in February 1827 and served on stations in many parts of the world over the next three decades. He was involved in combat operations along the Mexican east coast in 1847. 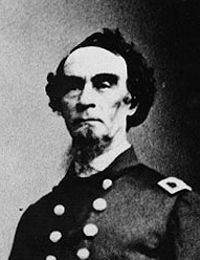 In early 1861, Commander Walke supported Unionist forces at Pensacola, Florida, during the events leading to the outbreak of the Civil War. Later in 1861, he commanded the "timberclad" gunboat Tyler during early operations along the western rivers. In January 1862, Walke took command of ironclad gunboat Carondelet, leading her through the intense actions that marked the first half of that year. Promoted captain in August 1862, Walke outfitted and commanded the large river ironclad Lafayette until July 1863, when he was ordered to command the converted cruiser Fort Jackson. The following September, he was made captain of the steam sloop Sacramento, an assignment that lasted through the end of the Civil War. Promoted commodore in July 1866, he commanded the Naval Station at Mound City, Illinois, in 1868–70. He attained the rank of rear admiral in July 1870 and retired April 1871. Immediately recalled, he served under Admiral David Dixon Porter and on the Lighthouse Board until April 1873, when he left active duty for the last time. Rear Admiral Walke continued an active life as a writer and artist until his death at Brooklyn, New York, 8 March 1896.